The New Staybridge Suites Atlanta- Midtown-The Body of Extended Stay with the Soul of Full Service.. Located on the top floors of the recently renovated Crowne Plaza Atlanta Midtown, in the citys trendiest neighborhood, the new Staybridge Suites Atlanta Midtown is a unique offering of all of the amenities our guest have come to expect from a Staybridge Suites along with many of the full service amenities provided by the Crowne Plaza. Enjoy incredible Suites comforts that include Full Kitchens, Flexible Workspace, and Living Area along with all of the standard Staybridge Suites services such as a Complimentary Hot Breakfast Buffet and Afternoon Social. Combine this with access to many of the Full Service Features provided by the Crowne Plaza like amazing Restaurants and Bar, Extensive Exercise Facility, and a Lobby Area that is laden with a host of entertainment options.With a MARTA transit station steps from the hotel and close highway access, traveling to and from Atlantas Hartsfield-Jackson International Airport is quick and easy. 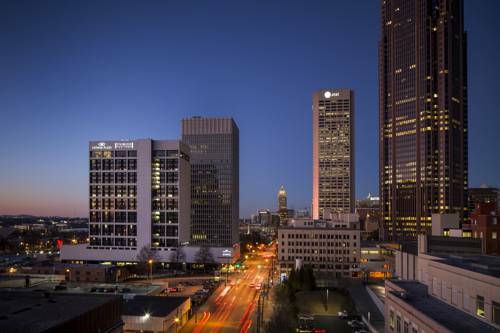 With our close proximity to local corporate offices such as Coca-Cola Headquarters, AT&T and Turner Broadcasting, our business travelers are assured a productive stay. Leisure guests enjoy the benefit of staying in the center of world famous attractions such as The Georgia Aquarium, World of Coca-Cola Museum, CNN Tour, The Georgia Dome, Philips Arena, The Fox Theatre, Turner Field and more. Midtown Place is shopping center located on Ponce de Leon Avenue in Midtown Atlanta. Midtown Place is anchored by Whole Foods and Home Depot with other Tenants including PetSmart, Staples and TJ Maxx.